On friday 19th of October took place the weekly-demo in Al-Ma’sara to celebrate 6 years of Al-Ma’sara Popular Committee struggle against occupation and the construction of the Apartheid wall. The demo started at noon from Al-Ma’sara and after passing through the villages of Marah Ma’alla and Jurat ash Sham’a, the colorful crowd of demonstrators headed for the Junction Road 3157, peacefully invading and blocking traffic for about an hour. The road was built by the Israeli Civil Administration to connect Gush Etzion bloc of settlements with settlements of Tekoa and Nokedim; according to the project of construction of the wall, the road will become for the exclusive use of settlers with the purpose of connecting the settlements in the West Bank with Jerusalem. Palestinians, internationals and Israelis managed to arrive at the entrance of the road without particular difficulty forcing the blockade imposed by the army. After an initial confrontation, the demo continued its march waving Palestinian flags and posters against the occupation and singing chants to the rhythm of drums. The traffic stop involved several cars belonging to settlers and a bus with Israeli soldiers. The event was held in the wake of the roadblock Road 443 that took place last Tuesday and organized by the Popular Struggle Coordination Committee to focus on settler violence towards Palestinian farmers during the olive harvest and the system of segregation in some West Bank roads. The demonstration ended peacefully and with the meeting of the participants of the event at the cultural center al-Shmoh. 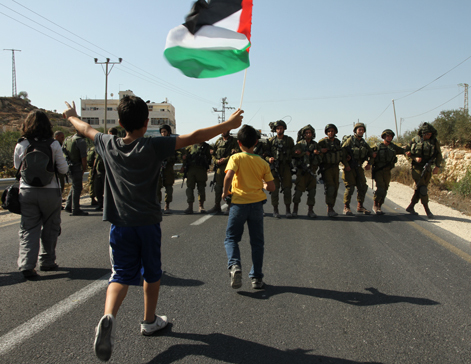 Posted in Uncategorized and tagged Al Masara, demonstration, palestine, west bank. Bookmark the permalink.